Somebody needs to have a calm yet firm sit-down discussion with Nissan. Putting tracks on existing cars doesn’t make them inherently exciting or new or different. Nissan has been doing this for years, and it’s become boring and formulaic. 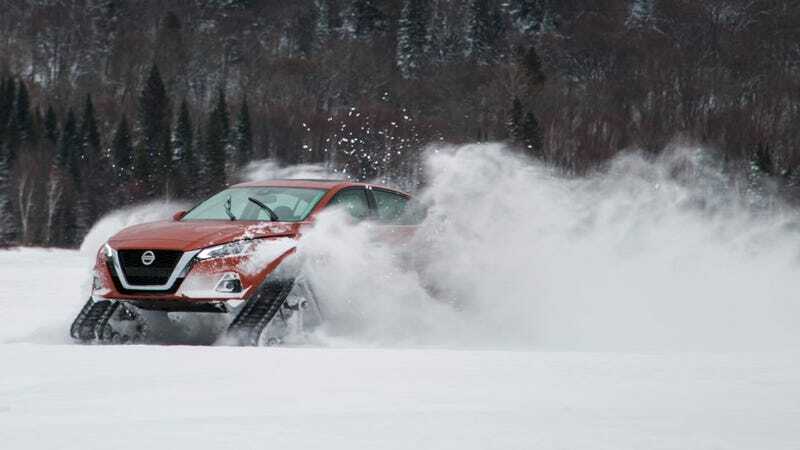 Anyway, here’s an Altima with tracks on all four corners and all-wheel drive. It’s got fender growths. Dubbed the Altimate AWD, Nissan says this is “a sedan unlike anything Nissan has presented before” which is true, except the company has done this exact thing on two different Jukes and a 370Z in just the last couple of years. It’s a pointless exercise that is intended to get attention for Nissan’s models, but it’s never going to have the huevos to offer a car on dealership lots with track accessories, so I’ll continue to yawn when I see this. The Altimate AWD will debut at the Canadian International Auto Show in Toronto next month. Altima sales were down in the U.S. market nearly 18% in 2018 versus 2017, according to goodcarbadcar.net, so it’s pretty obvious that Nissan is just trying to get some attention for the shrinking sedan segment, but as the youths say these days, this ain’t it, chief. Now, since you have these fender flares anyway, let’s talk about touring car racing.